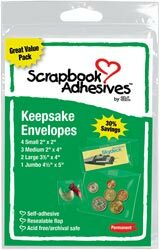 3L Scrapbook Adhesives Keepsakes Envelopes are perfect for storing and preserving memorabilia and keepsakes such as your child's first lock of hair, baby teeth, concert tickets, coins, newspaper clippings, and much more. Archival-safe, acid-free, self adhesive pockets are easy to place in scrapbooks and memory books, prevent acid-transfer and helps keep memories forever. (1) jumbo 4.5"x 5" keepsake envelopes.